• Janeen Brian’s Yong to be adapted for stage! Janeen’s Young Adult novel Yong is going to be adapted to stage by the Monkey Baa Theatre Company. Multi-award winning, Yong follows the journey of a thirteen-year-old boy who begrudgingly leaves his home in China to travel with his father to the goldfields in Ballarat. The arduous journey is full of adventure, danger and despair; leaving Yong to question whether he has the courage to face what lies ahead. - Stay tuned for updates! • Five JDM authors featured on Reading’s ‘Most Anticipated Books of 2019’ list! Readings’ annual auspicious list for the ‘Most Anticipated Books of 2019’ is here, boasting five of our own authors and their new titles. Carly Findlay’s Say Hello; Judith Brett’s From Secret Ballot to Democracy Sausage; Leah Kaminsky’s The Hollow Bones, Katherine Collette’s Swallow, and Fiona Hardy for her upcoming middle-fiction debut How to Make a Movie in Twelve Days were amongst the other notables. AUTHOR ACHIEVEMENTS • Dr Christine Durham awarded the Order of Australia Medal for her service to education. Christine has made a significant contribution to our understanding of the health challenges of acquired brain injury since 1995, through her writing, speaking and educating. From 2015-2017 she was an ambassador for Shine a Light on Brain Trauma, Road Trauma Support Services as well as an ambassador for the National Australia Day Council. • Tracy Sorenson’s debut novel The Lucky Galah receives a wonderful commendation. The Lucky Galah follows the story of the Apollo moon landing in 1969, from the perspective of Lucky the galah. Because Tracy’s novel also references Donald Horne’s famous book The Lucky Country, we couldn’t have been more thrilled and surprised when we received a response from Donald’s son, Nick. The Lucky Galah also includes moments where Lucky tears to shreds only the best books she can find, one of which being The Lucky Country. Nick told Tracy that “there are a few who have tried to tear that book to shreds, but “none who have done it so sympathetically.”Also noting that he feels Tracy and his father “both drink from a similar well”. AUTHOR ACHIEVEMENTS • Jenna Guillaume and Leah Kaminsky both named in Librarians Top 10 Choices for March! The Librarians’ Choice awards for March sees Jenna Guillaume’s debut Young Adult novel What I Like About Me, and Leah Kaminsky’s latest fictional tale The Hollow Bones make the shelf for their Top 10 pick. What I Like About Me is a sweet coming of age novel following protagonist Maisie Martin and her wild summer- released in late February. The Hollow Bones released in early March, and brings to life one of the Nazi regime’s little-known villains through the eyes of the animals he destroyed and the wife he undermined in the name of science and cold ambition. • Robert Hillman’s The Bookshop of the Broken Hearted published in the US. Congrats to Robert Hillman whose book was published in the US under the prestigious Putnam Imprint, along with a gorgeous new cover! • Three JDM clients were listed on Booktopia’s ‘Celebrating Women’ list! In honour of International Women’s day (March 8th), Booktopia has published a collection of works by inspiring female writers to encourage the celebration of the achievements of women everywhere. Among this list of “cultural icons, powerful leaders, revolutionary thinkers and inspirational artists... women who have helped shape the world” are our own Clare Wright, Clementine Ford and Carly Findlay for their latest non-fiction works. Judith Brettâ&#x20AC;&#x2122;s novel The Enigmatic Mr Deakin has been shortlisted for the 2019 Ernest Scott Prize! Supported by The University of Melbourne, the Ernest Scott Prize is awarded annually to the book judged to be the most distinguished contribution to the history of Australia or New Zealand, or to the history of colonisation in these countries. The winner is awarded $13,000 and will be announced on Wednesday the 3rd of April- best of luck Judith! art educator living in Melbourne. Through school visits, artist-in-residence programs, workshops and teaching as a Visual Arts specialist, Anne has enjoyed sharing her creative processes and storytelling with young children for many years. Lothian Books published her first picture book Unforeseen Circumstances in 2006. 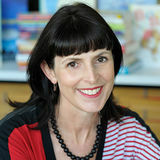 She is a published author/illustrator of children`s books with Black Dog Books, Lothian and Five Mile Press. Her passion for children`s picture books inspired Anne to participate on the creator`s table for the Australian stand at the Bologna Children`s Book Fair 2017 and 2018. Katherine Firkin has sold to Penguin Random House for her manuscript ‘The Magpies Treasure’. A graduate of the Faber Writing Academy, Jacinta read an extract of Katherine’s manuscript at the ‘Ready to Submit Programme’. Katherine is a Melbourne-based journalist, currently a full-time reporter with Ten News First. She has over a decade of experience, and has worked across every medium – print, online, television and radio – at some of the nation’s biggest outlets. ‘The Magpie’s Treasure’ is her debut novel and is inspired by the many criminal trials she has covered. Hamlyn-Harris is new illustrator joining the agency. He grew up in Thomas the suburbs of Brisbane, drawing, day-dreaming and melting plastic animals together to make hybrid monsters. After studying fine art and multi-media, he worked as a designer/art director for a range of companies. He began working as a freelance Illustrator in 2006 and created games, puzzles and mazes for educational publishers and had several of his books published along the way. His focus is now on illustrating and writing a graphic novel (of sorts) while juggling freelance projects, parenting and study. Tony Flowers and Peter Macinnis – Australian Backyard Earth Scientist	National Library of Australia Picture Book, February ***** here or in released this month? 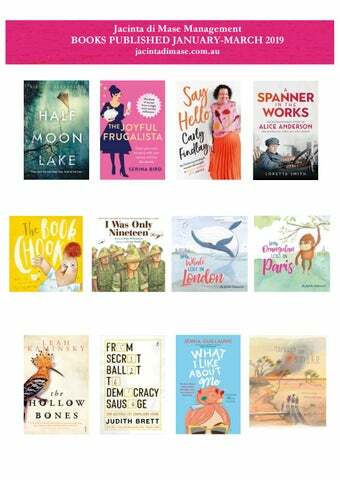 This year, Jacinta di Mase Management is thrilled to congratulate winners of the 2019 Children’s Book Council of Australia NOTABLE awards. Catch up on all the JdM news: new books, forthcoming titles, new authors and illustrators, awards, achievements, and international updates.